As an artist and baker, Whitney is fascinated by the origins of many of the foods we eat today which led her to look “outside the box.” In the early 1800’s Josiah Bent from Massachusetts decided to make a lighter and thinner version of Hardtack, a soldiers and seafarers staple. Bent rolled out sheets of dough, baked and hand “cracked” them. Whitney has been rolling out crackers this original way in my Castleton Vermont kitchen for family and friends for years. 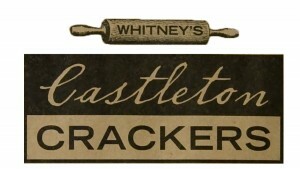 Castleton Crackers use all-natural ingredients. They mix, roll, bake, and then crack them by hand creating beautiful rustic looking crackers.